I loved the first one - and reviewed it a few weeks ago. I was thrilled to receive a copy of the second book. An amazing sequel, Hatshepsut's Collar exceeded my expectations. Exley writes in her goodreads.com review of the book that "it is easy to fall in love with someone, but then you have to figure out how to live with all their little quirks, and whatever they have buried in the basement". This is definitely an accurate description of the romance portion of this novel, which is one part of the book. The other part deals with the dangers wrought by Hatshepsut's collar. I think the romance is fantastic - it hit all the notes I wanted. Nate is a very protective, strong-willed criminal lord used to getting his own way. Cara's a wild soul, embracing her freedom after a horrific childhood experience, unwilling to be caged for any reason, even her own protection. Now, I've read a few comments that suggested that there's a disturbing, overly controlling aspect to the relationship, that Cara has no choice but to bend because of the circumstances. My experience of the book was definitely *not that. * Cara is presented as a supremely capable woman who could escape from Nate if she so desired (and there are many points in the book when he reflects on her ability to slip away). It never even occurred to me while reading that there was anything unequal about the relationship, and I think it's a disservice to Cara's character to think that she can't eke out whatever life she desires. I love these two together - very strong, clearly defined characters who need to cope with each other's rough edges. I enjoyed the sprinkling of Nate's perspective alongside Cara's. Often in these urban fantasy-type books we don't get the hero's thoughts and that can make them seem more foreboding, let's say, than intended. Nate's inner struggle was satisfying, and there's a moment at the end when everything comes to a head that's just... perfect. It's not the obvious moment, but... yeah. 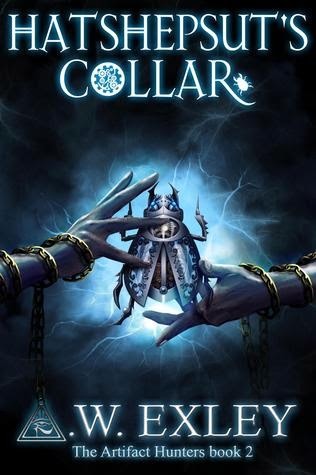 The collar plot is also a good one (and really the driving force of the book, even though I've fixated on the romance). There were some twists and turns that seemed obvious to me, but that didn't reduce my enjoyment of the novel at all. I like the way that mythology and fantasy are woven into the storyline. There's a ton of action in this book, with the appropriate gizmos and gadgetry. I think the action component is stronger, and there's less mystery, when compared to the first book. I wanted to soak this book up more quickly than I was physically able. The story ends with new opportunities and opens things up for many sequels, which I wholeheartedly approve of. I'm looking forward to Cara and Nate's numerous adventures over the years to come! Also: I am on board with a romance for Loki. Just saying. I enthusiastically recommend this novel - get the first one, Nefertiti's Heart to start! It's an excellent book as well, and you don't want to shortchange yourself! For fans of steampunk, romance, intrigue, Nefertiti's Heart (Book One in the series).